I think current "Navigator" window can provide the similar context info (except line number of method signature). I never have the Navigator window open, for me it takes up too much space. Like I said above, put your cursor on the closing brace. Also look at the second screenshot where you see the closing brace highlighted. Sorry, I don't get that display. I'm using the latest Dev-Build. Is there any option I need to turn on? Simply select the closing brace for a method where you can't see the method signature. Pretty cool. I often forget my context when working across more than one file. Sorry no dice. Not matter how I select the closing bracket (cursor before, cursor after, actually selecting it), nothing shows up for me. I guess it's some option that got messed up. 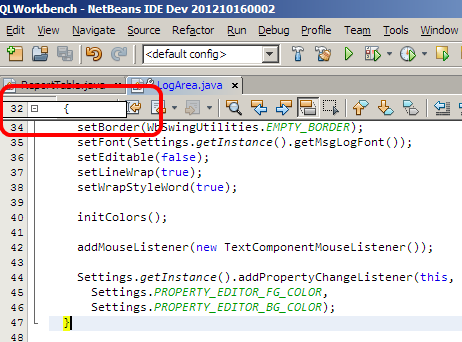 Probably you're not using NetBeans IDE 7.3 Beta. Drop me an e-mail at geertjan.wielenga@oracle.com and we'll sort it out together. So select the last bracket and you'll see what I'm seeing -- the method signature. I also noticed a "bread crumb trail" along the bottom of the editor which is similarly as helpful. NetBeans is AWESOME! Yup, that's one of the cool new 7.3 features too. In your example both are on the same line and therefor the method signature is shown as well. I see. Makes sense. So, would you prefer for the method signature to be shown anyway? You can add an issue to NetBeans issuezilla about that (and put a link to it here, I'll try and get it prioritized). Hey I can't find this , i downloaded netbeans 7.3 beta but i don't know how to make it work . Where in this blog do you read anything at all about PHP? This is cool but IMHO new Hierarchy viwever is what really was missing in earlier versions.